The Berlin Biennale is a contemporary art exhibition which has been held at various locations in Berlin, every two to three years since 1998. The curator or curators choose the artists who will participate. The IX Berlin Biennale was represented by curatorial team of the New York based collective DIS, composed of Lauren Boyle, Solomon Chase, Marco Roso, and David Tor. Made with and for Meiré und Meiré, DIS Collective, and KW Institute for Contemporary Art. The future feels like the past: familiar, predictable, immutable – leaving the present with the uncertainties of the future. Is Donald Trump going to be president? Is wheat poisonous? Is Iraq a country? Is France a democracy? Do I like Shakira? Am I suffering from depression? Are we at war? 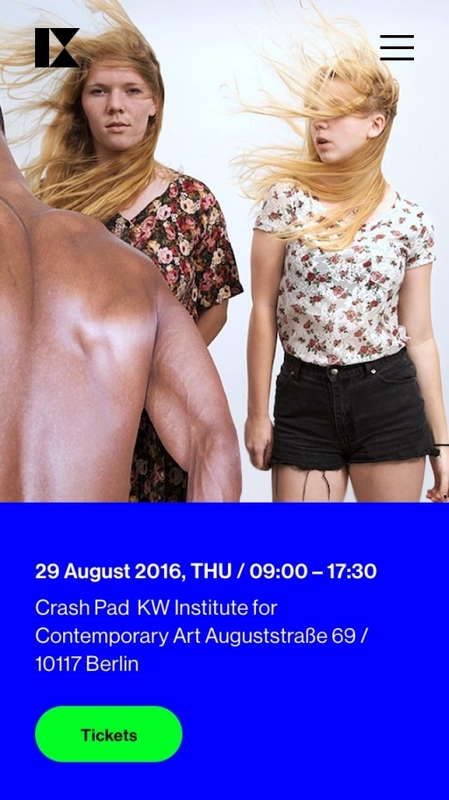 (…) The IX Berlin Biennale for Contemporary Art materializes the paradoxes that make up the world in 2016: the virtual as the real, nations as brands, people as data, culture as capital, wellness as politics, happiness as GDP, and so on. In doing so, though, The Present in Drag successfully calls out the capitalist corruptions of the environment we all inhabit — and particularly these corruptions’ iterations within the supposedly free zone of contemporary art, critical theory and academia. In this way, viewers, admittedly many of whom are de facto members of this expanded peer group, are forced to acknowledge their complicity within the very problems and hypocrisies that they might claim to abhor — ideally, to better address them. The everyday lives represented in The Present in Drag are defined by contradiction: we’re extorted by our landlords for rent to live in urban centres, yet we Airbnb our rooms in art-world off-seasons to recoup cash while perpetuating gentrifying rent hikes. We talk about MoMA strikes while travelling in Ubers and buy Boris Groys books on Amazon. Social justice has found its home on corporate social-media platforms, and young feminists feel protective of Beyoncé, a multi-millionaire, when she was called a terrorist by the black feminist doyenne bell hooks. DIS have distanced themselves from the effervescent, slightly chaotic juxtaposition of various temperaments, backgrounds and aesthetics that is often the trademark of biennials in favor of a highly cohesive exhibition; it is a bit like their website or a magazine that has a specific take on the world and which embeds this in an aesthetic, you can even say in a brand. This is DIS’s approach and it is right for and brave of the Berlin Biennale to give the group free rein. Biennials are only ever interesting when sticking their necks out. 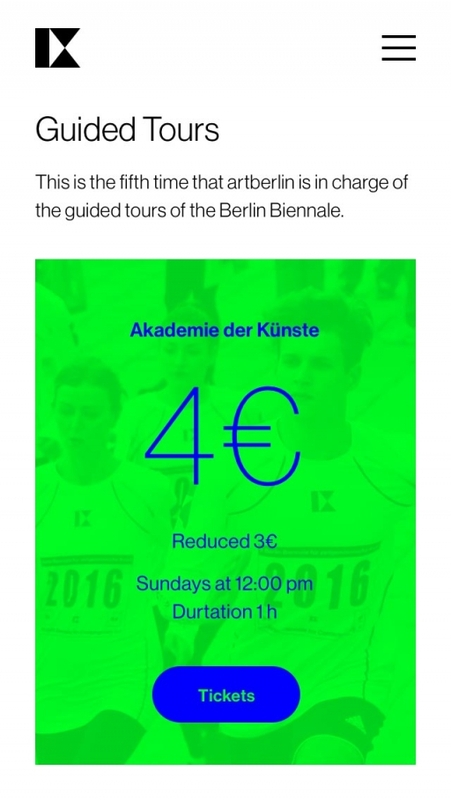 The IX Berlin Biennale website appeared to be a digital playground covering both pragmatic needs of event organisers, and realtime realisation of artistic visions for curatorial team. Several flexible formats gave creators numerous opportunities to play with any kind of content regardless its size, amount and quality. The project received a wide coverage in both domestic and international press.